There are very few books of Native poetry for teachers looking for poems to use with children and young adults. 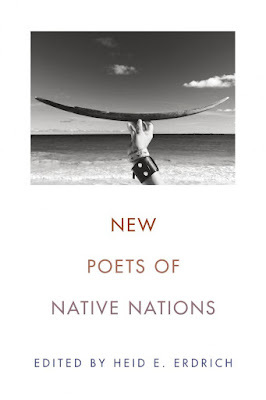 They can, however, get a copy of New Poets of Native Nations, edited by Heid E. Erdrich. might wonder, "What is the Dakota 38?" There's a lot more, after that. Long Soldier's poem is a history told with integrity and respect for the 38 and for Native people. In the next parts, he talks about some of the things we do in school (diagramming sentences)--which is one world view--and the other? Well... it isn't one where anybody diagrams sentences. That poem is followed by "It Goes Something Like This" which is about two children, going to Carlisle Indian School. And "Snagging the Eye from Curtis" is a brilliant critique of those sepia-toned photographs that far too many people view as authentic. As I conceived of this book, I wanted to select and present a substantial and strong gathering of work by U.S. Native writers. I wanted to avoid the ways Native American poetry, most edited by non-Natives, has been presented—with a lot of apparatus and within binary notions of an easily digestible “American Indian” history or tradition in order to tie contemporary to past in a kind of literary anthropology. 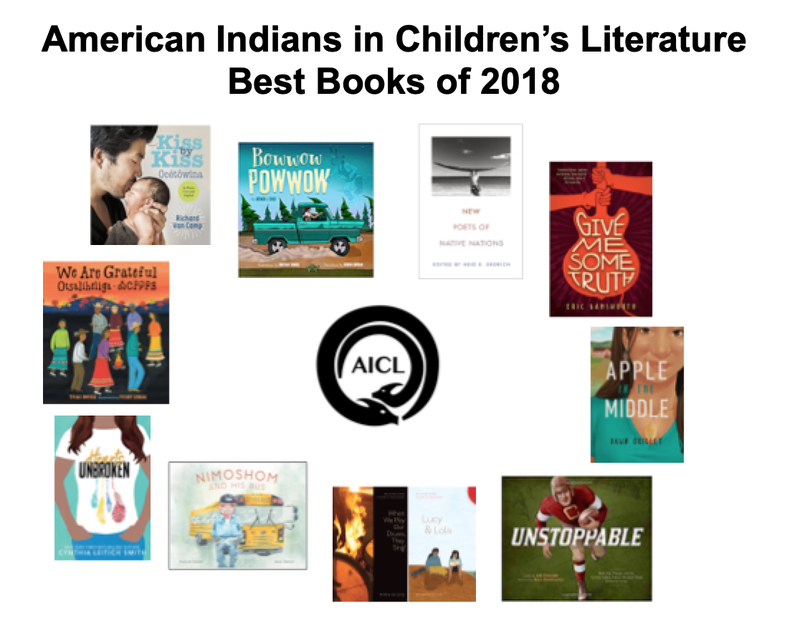 I did not want to add to the body of literature that allows “Indians” to exist in the past, or in relation to the past, but remain invisible in the world we all inhabit now. New Poets of Native Nations. Get several copies! Give them away. Some books are described as "a gift" to readers. This one is that, for sure. Published in 2018 by Graywolf Press, I highly recommend it. You know how some things are so dear that you hold that thing close to your heart and give it a squeeze? Every year, Richard Van Camp creates books for young people that make me want to do that. 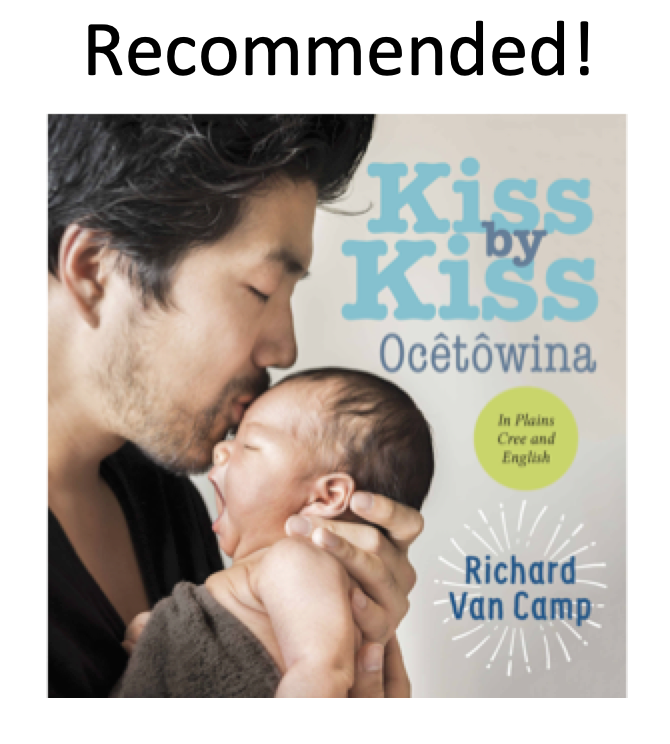 This year, it is Kiss by Kiss/Ocêtôwina: A Counting Book for Families. His oh-so-perfect words in this board book were translated into Plains Cree by Mary Cardinal Collins. It starts with "One kiss, two kiss, three kiss, four!" and so on. 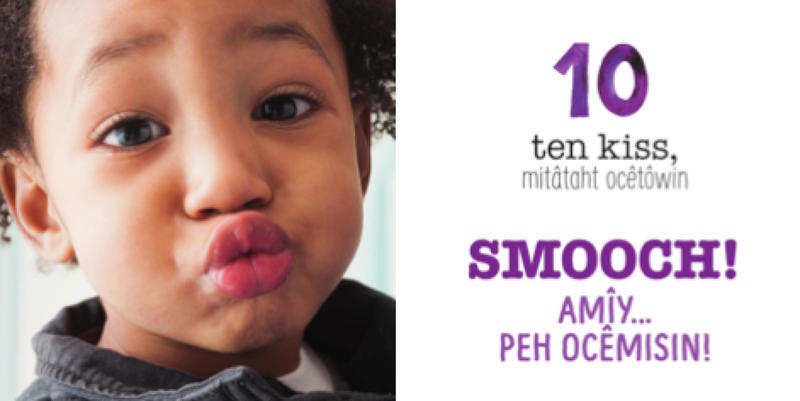 Facing these pages of words in English and Plains Cree are delightful, endearing photos of babies and toddlers and grown-ups, planting kisses. That cadence is interrupted by this photo, and, a smooch! That smooch launches us into a series of pages where we read "Your kisses are so sweet!" and "Your kisses are so fun!" and "Your kisses are as welcome as the light from the sun!" I read Kiss by Kiss/Ocêtôwina after having spent a raucous hour playing with my niece's little girl. We played with a stuffed bear and a snowman, chasing each other around my mom's house. After each spree down the hall, she looked up at me with her twinkling eyes that said 'let's do that again'--and so we did. The photo on the right is the two of us, at one moment in that zany playtime! That 'let's do it again' look is where Kiss by Kiss ends, too. The final page is "Please can we start again at kiss number one?" It'd be fun to read this book to her (and the bear and snowman)! This is one of those books you'll want to give to lots of people. And--lots of people are in it! Some people might look at the photos and think the people in them don't "look like Indians" because far too many people carry stereotypical ideas of what Native people should look like. In fact, every person shown in the book could be a tribal member or citizen of a Native nation! In every book, Van Camp gives us so much. 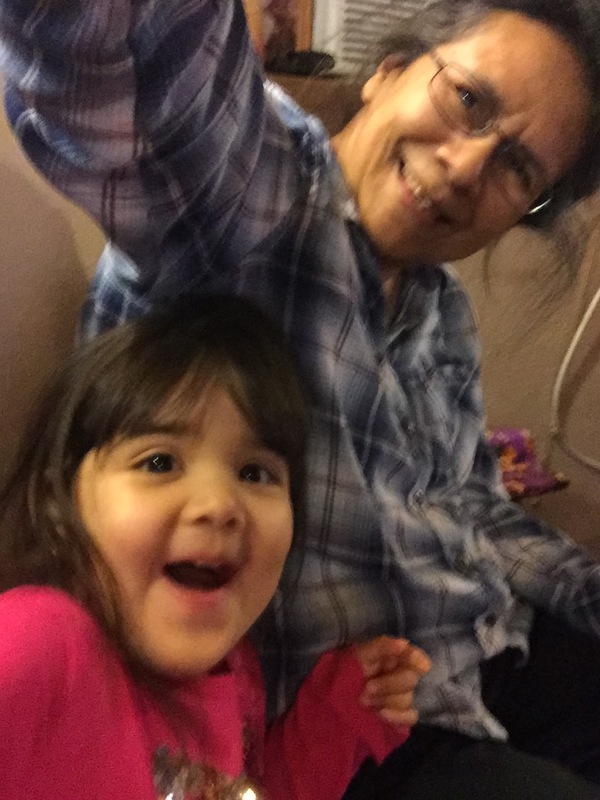 Native people see things others may miss, but that's ok. Those are, to use Cynthia Leitich Smith's phrase, "brushstrokes" that are subtly placed mirrors for Native readers. 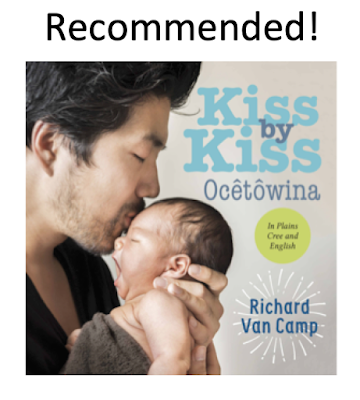 Published in 2018 by Orca, Richard Van Camp's Kiss by Kiss/Ocêtôwina is highly recommended. Get a copy. You'll see. It is a delight! 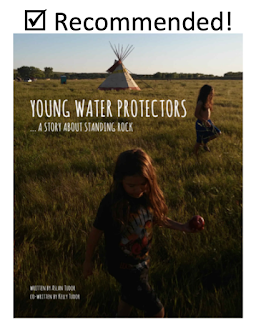 Aslan and Kelly Tudor's Young Water Protectors: A Story About Standing Rock is a non-fiction photo-essay published by EagleSpeaker Publishing. The "about" page tells us that the author, Aslan Tudor, was eight and nine years old during the period depicted in the book, and a citizen of the Lipan Apache Tribe of Texas. Information provided is his first-hand account of time spent at the camps when he was there in 2016.
exploiting people and hurting earth's resources. There's a lot to think about, packed into this slim book. Tudor touches on the school at the camp, and what he learned there but he also notes that activity at some of the construction sites wasn't safe. It was safer for kids to stay in camp. For readers who want more information about that, adults can fill in the gaps according to what they know about the reader. I haven't done a rigorous study of biographies of US presidents. The ones I have looked at over the years are lacking in one way or another. Most leave out Native peoples and nations that presidents interacted with--or the information that is included, is biased. In Who Was George Washington? (one of the books in the very popular "Who Was" series published by Penguin), we read that when he was young, George Washington worked as a surveyor--someone who measures and marks property boundaries--to make money. It was "a rough life" in the "wilderness," sleeping on the ground, cooking over open fires, and, he had to "steer clear of hostile bands of Indians" (page 18). That book came out in 2009. Many people in children's literature think that Russell Freeman wrote excellent nonfiction for kids, but his writing was biased, too. In his biography of Abraham Lincoln, he wrote that Lincoln's father was "shot dead by hostile Indians in 1786, while planting a field of corn in the Kentucky wilderness" (p. 7). Titled Lincoln: A Photobiography, it won the Newbery Medal in 1988. I hope that a book that has bias like that in it would not be selected, today, for that medal. Was Washington racist? What about Lincoln? And--are the authors of those books racist? The point: there's a lot to consider in how someone writes about a president. 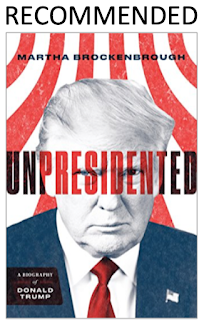 Let's turn now to Martha Brockenbrough's Unpresidented: A Biography of Donald Trump, due out on December 4th from Feiwel and Friends. Anybody who has followed the news about the current president of the US knows that he's said a great many racist and sexist things. Brockenbrough doesn't shy away from any of that. 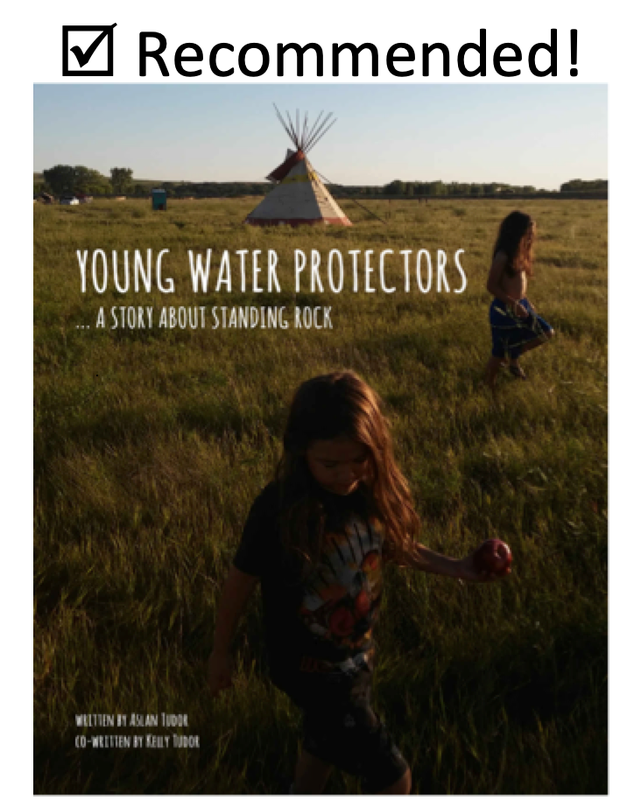 I'm glad it is all here, documented, for young adults (the book is marketed for kids from age 12-17). I'm also glad that she's included information about Native people. On page 98 she provides an account of trump's (I do not use a capital letter for his name) 1993 testimony at a hearing in Congress, at the House Natural Resources Subcommittee on Native American Affairs. She quotes him saying that "they don't look like Indians to me..." He was talking about Native people of tribal nations in Connecticut who had casinos that hurt "little guys" like him. At the time, trump was trying to make a deal with the Agua Caliente Band of Cahuilla Indians. A few pages later, Brockenbrough provides readers with the name of another tribal nation. In 2004, the Twenty-Nine Palms Band of Mission Indians ended their contract with trump's hotel and casino company, because his company was in financial trouble. It is terrific to see Brockenbrough being tribally specific. By naming these nations, she is pushing back on a widespread ignorance in the US. Too many people use the word "Indians." And it often leads people to think of Native peoples in stereotypical ways. Another good point of Unpresidented is information on page 100, about tribal membership. Succinctly, Brockenbrough writes that tribal nations make determinations about their citizens. What they look like doesn't matter. Oh! Another thing to note is the part about arrowheads! It tells us a lot about the trump family and its values. I recommend Unpresidented and welcome your comments if you read it. And--kudos to Brockenbrough for writing this book! Reading the news every day is tough on my psyche. Spending the time necessary to write this very comprehensive and in-depth book must have taken a toll on her.